As you can imagine, it’s been a busy month since the release of Secrets We Keep at the beginning of Feb — I had hoped to cross post from the lovely bloggers featuring the book each day, but I’m afraid that this time round social media has become a lot more… social! So, there’s been quite a bit of… socializing on each stop. But never fear — March promises to be a little quieter so I do hope to get started on featuring each of the blogs over the next few weeks right here! 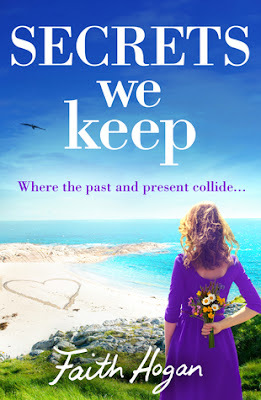 Here’s a link to Sophie’s blog and her review of Secrets We Keep. Two distant relatives, drawn together in companionship are forced to confront their pasts and learn that some people are good at keeping secrets and some secrets are never meant to be kept. A bittersweet story of love, loss and life. Perfect for the fans of Patricia Scanlon and Adele Parks. The beautiful old Bath House in Ballytokeep has lain empty and abandoned for decades. For devoted pensioners Archie and Iris, it holds too many conflicting memories of their adolescent dalliances and tragic consequences – sometimes it’s better to leave the past where it belongs.For highflying, top London divorce lawyer Kate Hunt, it’s a fresh start – maybe even her future. On a winter visit to see her estranged Aunt Iris she falls in love with the Bath House. Inspired, she moves to Ballytokeep leaving her past heartache 600 miles away – but can you ever escape your past or your destiny? Two distant relatives, drawn together in companionship are forced to confront their pasts and learn that some people are good at keeping secrets and some secrets are never meant to be kept.